The two Trentham cannons have the following characteristics. Carriages: The cannons sit on two different types of mounts. These are a square riveted-metal box shape and an open-framed, lightweight carriage. Both are on wheels which are later additions. The square box-shape mount is a metal replica of a standard wooden firing base used on board ships or in garrisons. This metal base has been built for display purposes and may date from about 1936 (the date cast on the wheels) when they were in the possession of Mr Bothamley. The 'open-frame' mount is referred to as a 'garrison' carriage and was used for moving cannons around forts, etc. Because the carriage was cast metal and quite brittle the guns would not have been fired from this platform as the shock would destroy it. 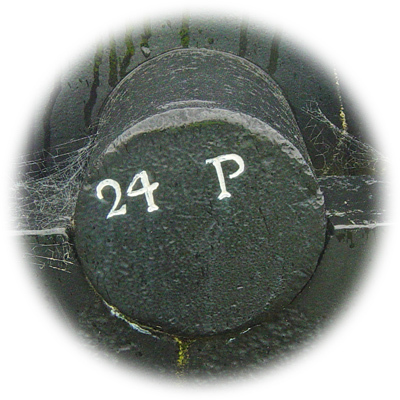 24 Pounder: The cannons at Trentham Camp are marked '24 Pr' and are therefore '24 Pounder' guns. Up until the early 1700's there were many variations of guns manufactured for British artillery, each gun type being know by an historic name. From 1716 a rationalised version of gun manufacture was adopted for the Royal Ordnance. A key aspect was setting gun sizes based on the size of shot they fired, the standard for large guns being set at 4, 6, 9, 12, 18, 24, 32 and 42 pounds (where 1 pound = 0.45 kg). (From British Cannonball Sizes Website.) In the image above the 'r' following '24 P' has not been painted. SBML: The Trentham cannons are smooth-bored and are loaded with shot from the muzzle. This category of weapon is termed SBML for smooth-bored muzzle loading. Later advances in gun technology include manufacturing guns with 'rifling', the spiral grooves carved into the inside of a cannon barrel, and loading the munitions into the barrel from the rear via a breech block. Such weapons are referred to as RML for Rifled Muzzle Loader and RBL for Rifled Breech Loader. Blomefield Pattern: In the late 1700's Britain's gun manufacture was in a poor state. This changed in 1780 when Thomas Blomefield was appointed Inspector of Artillery and Superintendent of the Royal Brass Foundry. He condemned over 400 poorly-manufactured guns, experimented with new gun styles and developed a new standard for the manufacture of British big guns. (From The Age of Sailwebsite.) The Trentham guns were manufactured to this standard and are therefore known as 'Blomefield Pattern' or 'Government Pattern' guns. 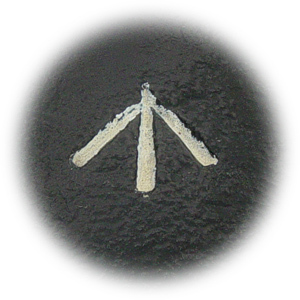 Barrel Top Markings: The barrel has an embossed crown above a stylised mark of a 3, G and R entwined. 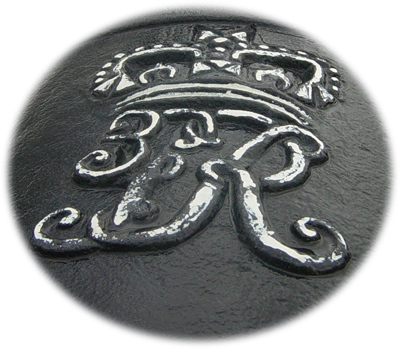 This stands for '3 George Rex' and is the royal symbol of King George III who reined 1760 - 1820, the period when the guns were manufactured in 1812 and 1813. In fact, King George III had by then succumbed to mental illness and his son George, the Prince Regent had been granted Regency powers in 1811. Below the crest is a broad arrow signifying British government ownership of the weapons. 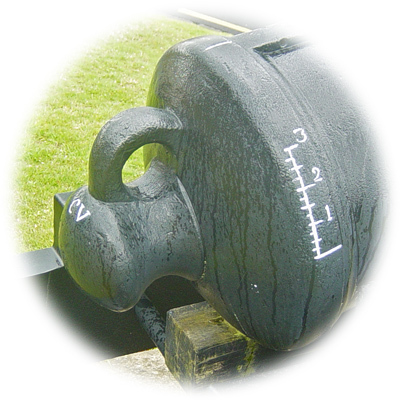 Breech-end Markings: The cannons have a sighting scale on the side of the breech to assist adjusting the firing position of the gun. 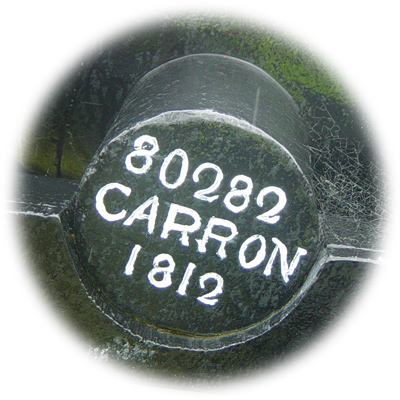 The end of the gun is marked with the letters 'CV' which signify that the gun had a 'copper vent' lining the fuse hole in the top of the cannon. 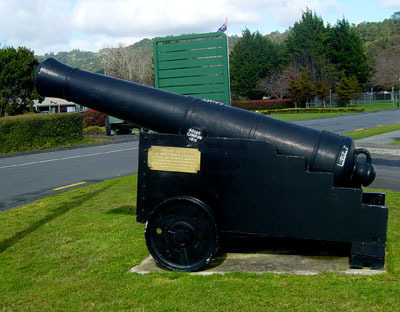 Other Cannons: Similar Carron-manufactured 24 Pounder cannons in New Zealand are located on top of Mt Victoria, Wellington (where the gun had been fired at midday as the noon time signal) and beside a road in Napier. Both those guns are mounted on garrison carriages. Mr M.S. 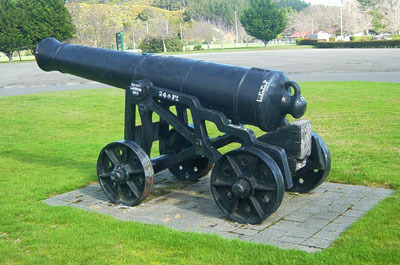 Evans, Assistant Curator of Weapons and Ammunition at the National Army Museum at Waiouru has been particularly helpful in establishing the possible origins of the two Trentham cannons. “Clay Hill was completed first and had three of the guns installed on their wooden carriages. Eventually the Thorndon Flat position was completed and it had one gun until 1846 when a second was moved down from Clay Hill. Both of these positions were used by detachments of the 58th and 96th Regiments during the late 1840's but the cannons were 'manned' by settler volunteers. Mr Evans said a 24-pounder refers to the weight of the shell that was fired from the cannon. It was usual for the migrant ships to sail quite heavily armed. He said a commercial ship would often have about a dozen cannons. He advised that there was a 24 pounder cannon in the grounds of the Waiouru Military Camp. It had arrived there in 1968 and he wondered if it had come there from Johnsonville. The next section in this article provides research commentary.